East Press is a Japanese comic publishing house. They publish, among other things, manga adaptations of the world’s most notable pieces of writing; You know, things like Darwin’s Origin of the Species and Marx’s Das Kapital. In 2008 they published a cartoon version of Adolf Hitler’s Mein Kampf, which, like it or not, is a fairly significant piece of historical literature. Well, as Comics Alliance reports, Nissim Ben-Shitrit, the Israeli ambassador to Japan, is decidedly in the “not” column – especially given that the initial run of Mein Kampf ended up selling thousands more copies than East Press’ other adaptations, before ultimately selling out entirely. When I saw the drawing of Hitler with swastikas and Japanese captions, I was shocked. It’s unthinkable that an enlightened person would read Hitler’s book. Luckily, the book has exhausted itself and is no longer on the shelves. What’s a diligent protector of “enlightened” people everywhere to do? Turn to the bible, of course. Or, rather, encourage everyone else to turn to the bible. 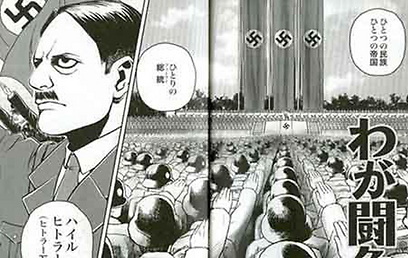 Ben-Shitrit convinced East Press that the best anecdote to manga Hitler is manga Torah. And so, highly stylized comics adaptations of the books of Genesis, Kings, and the Prophets, have been produced to counteract any ill effect the cartoon Führer may have caused. Now I’m hoping that young people in Japan will be exposed to the heroes of the Bible. I don’t think that [East Press] maliciously intended to publish something anti-Semitic. It’s a small company that publishes manga books, and they thought their readers would be interested in it. In light of this successful cross cultural exchange, and the Japanese comic industry’s newfound interest in Judaica, can manga Heeb be far behind?